It’s how he coaches. It’s how he leads. It’s how he prays. It’s how he lives out his faith. In particular, Brown has a strong passion for the Bible, which first developed as a sophomore in high school when he began attending a Bible study for teenagers led by a devout Catholic woman in his Martha’s Vineyard neighborhood. Brown’s reputation for never backing down from an opportunity to share that passion was powerfully displayed on November 12, 2011 at Beaver Stadium. It was the first game for Penn State following the firing of head coach Joe Paterno amid the fallout from the infamous Jerry Sandusky sexual abuse scandal. Nebraska was the visiting team on that somber day. But something unusual had been taking place behind the scenes earlier in the week. Brown was inspired to organize a pre-game endzone prayer with players from both teams. 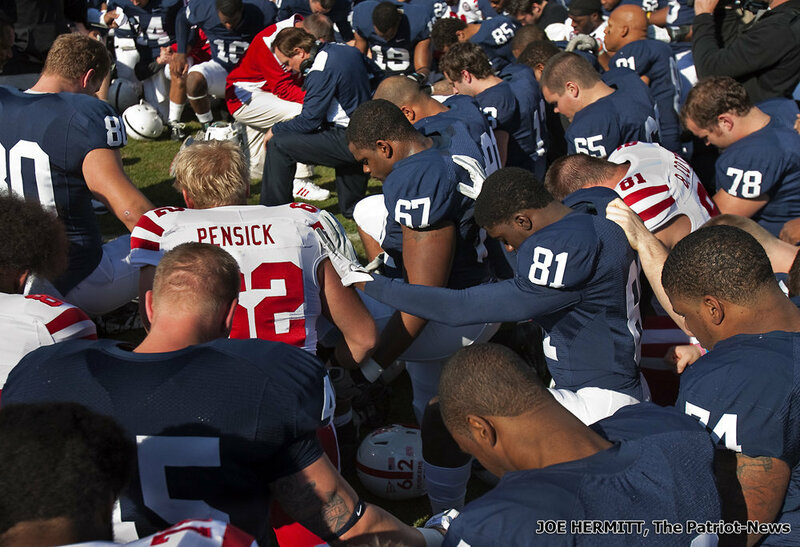 Not confident he would get permission, Penn State head coach Tom Bradley at the same time had allowed his team to meet at midfield to pray and they wanted the Nebraska players to join them. Brown was ultimately asked to lead the meeting. With about eight minutes left before kickoff, both teams came back onto the field and gathered at the 50-yard line. As 107,000 fans stood silently in the stands, Brown began what was supposed to be a 45-second prayer that instead lasted twice as long. No one seemed to mind. Even ESPN captured the moment and shared it with a national audience. Afterwards, several Nebraska and Penn State players came back to midfield and asked Brown to pray again. ESPN, CNN, Fox Sports, and Fox News were among the national news outlets that continued to capture footage of the unfolding events. Nebraska won the game, 17-14, but the end result was by no means the most important thing that happened that day. It was Brown’s Bible-inspired prayer that would resonate in the hearts and minds of college football fans in University Park, Pennsylvania, and beyond for weeks to come. Dear Lord, thank You that You came to this Earth and became flesh and lived among us. Thank You for the lessons we can learn from You. Help us to be bold in our faith. In the Name of Jesus, Amen.